ARMAGNAC is a distinctive kind of brandy produced in the Armagnac region in Gascony, southwest France. It is distilled from wine usually made from a blend of grapes including Baco 22A, Colombard, Folle blanche and Ugni blanc, traditionally using column stills rather than the pot stills used in the production of Cognac. The resulting spirit is then aged in oak barrels before release. Production is overseen by the Institut national de l'origine et de la qualité (INAO) and the Bureau National Interprofessionel de l'Armagnac (BNIA). Armagnac was one of the first areas in France to begin distilling spirits, but the overall volume of production is far smaller than Cognac production and therefore is less known outside Europe. In addition they are for the most part made and sold by small producers, whereas in Cognac production is dominated by big-name brands. Bas-Armagnac is one of the three plantation areas in the Armagnac area where grapes for the distillation of the Armagnac eau-de-vie can be cultivated. It extends over the Landes and Gers departments and represents 57% of the vineyards. It lies in the west, beside Armagnac-Ténarèze, an undulating area; the grapes grow in acidic, argillaceous and stony ground. Iron rust colors parts of the soil and these spots are called "sables fauves". Major towns in the Armagnac region include Eauze, Cazaubon and Nogaro. 10 best armagnacs - "Discover the complex French brandy with one of these superior bottles." A to Z of Armagnac brands - "No matter which Armagnac brand you're looking for, you'll find it here." 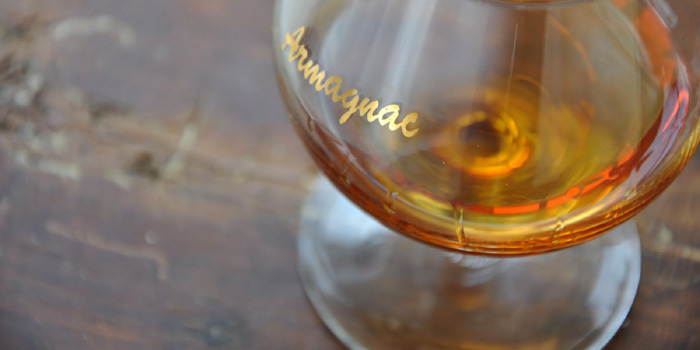 ARMAGNAC - the oldest brandy distilled in France, and in the past was consumed for its therapeutic benefits. The first mention of Armagnac dates back to 1310 when Prior Vital Dufour wrote a treaty on medicine in which he laid out the 40 virtues of the liqueur produced in southwest France. LE COGNAC - since 1996. Online store: 101 armagnacs. Armagnac CastarÈde Vintage - "Castarede Vintage Armagnac might be labeled as Armagnac or Bas Armagnac. Beautiful deep hue, progressive aroma." ARMAGNAC DE CASTELFORT Bas Armagnac - Bas Armagnac lies on the western side of the Armagnac region of France. Bas Armagnac is also known as Armagnac's 'Grande Champagne'. 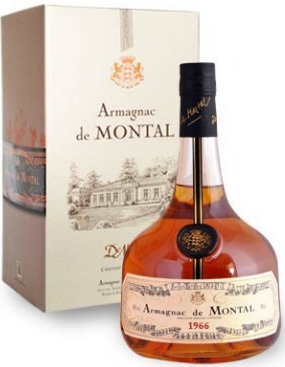 Armagnac de Montal - "Olivier de Montal, a worthy representative of the spirit of the musketeers and a man who is keen to portray the best image of Armagnac, personally selects the bottles of Armagnac, which carry his name as part of his commitment of loyalty towards a policy of high quality." ARMAGNAC DELORD - since 1893. ARMAGNAC DUPEYRON - since 1905. Armagnac Ryst Dupeyron 1878 - "Ryst Dupeyron have one of the largest vintage collection of about 100 different years from 1850." Armagnac XO ChÂteau du Tariquet - "An intense bouquet, steeped with the aromas of freshly baked bread, toast and candied fruit." ChÂteau de Castex d'Armagnac - "20 exclusive vintages from an estate that enters History with Henry IV." ChÂteau de Pellehaut Reserve Tenareze Armagnac - "Made from a 50/50 blend of Ugni Blanc and Folle Blanche, Château de Pellehaut 'Reserve' is aged 10 years. There’s complexity here, a balance of savory, fruity, and minerality, as well as long attractive finish." CHÂTEAU DU BUSCA-MANIBAN - "Distilled for 300 years in the oldest distillery in Gascony, Château du Busca-Maniban armagnacs continue to be produced at the property according to traditional methods." Hors d'Age Dupeyron armagnac - Manufacturer: Ryst-Dupeyron is settled in Condom, in the very heart of the Armagnac region, in the beautiful house of the Marquis de Bonnas. Marquis de Montesquiou - founded in 1955. SAMALENS - Founded in 1882, the Maison Salamens is located in Gascony, in the heart of a region whose rich tradition and know-how go back 700 years. The wines selected come from Bas-Armagnac, and the greater majority from Grand Bas-Armagnac, where the noblest Armagnac is produced. The estate's stock of hundred-year old brandies is one of the largest in the world. 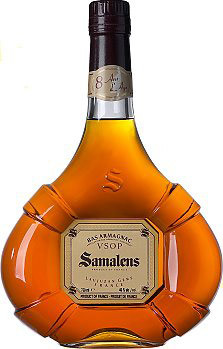 SINGLE DE SAMALENS - aged 15 years Single Grape Bas Armagnac.